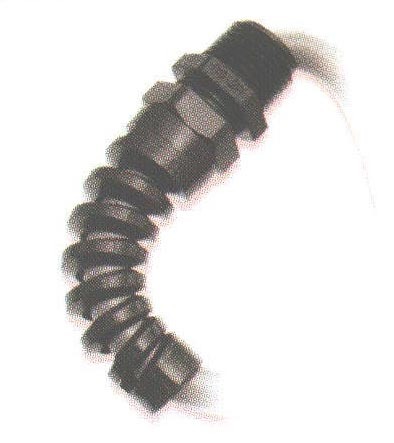 Liquid Tight Pigtail Cordgrips - US Patent No. 5405172 - Bolt Products Inc.
Six sizes for cable, tubing, etc. with diameters ranging from .069" (1.8 mm) to .709" (18.0 mm). Acme threads on body prevent skipping and speed installation. Flexible “Pigtail” extender prevents sharp bends and extends cable life. We recommend using the fitting with the smallest maximum diameter that will fit your application. All nylon construction with TPE or Buna N Sealing Gland resists salt water, weak acids, gasoline, alcohol, oil, grease, and common solvents. This feature is not assessed by UL certification or testing. Working temperatures : -22°F (-30°C) to 212°F (100°C).